The parents of a pair of conjoined twins separated in Dallas over the weekend say they're thrilled with the surgery's successful results. Owen and Emmett Ezell are stable, though they are still getting help breathing. Doctors at Medical City Children's Hospital say the brothers are the third set of conjoined twins it has treated in the last 10 years. Their separation surgery was the first the hospital has performed. Their mother, Jenni Ezell, said she's "just ready to rejoice" now that the procedure is done. "This is Emmett — he has a little more hair at the moment — and this is Owen," she said of her infant sons. "He's more of a baldy at the moment." 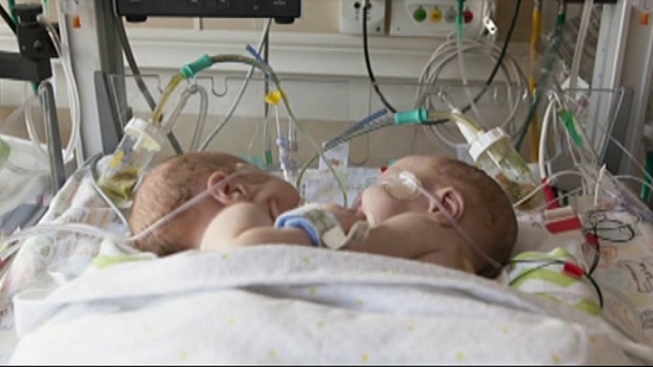 The six-week-old twins were surgically separated on Saturday, in what doctors say was a nine-hour operation. Doctors are cautiously optimistic about the brothers' futures, during which they will have at least two to three more surgeries. Their parents are focused on smaller milestones. "I look forward to holding them for the first time," Ezell said. "That will be a huge moment, taking them home." 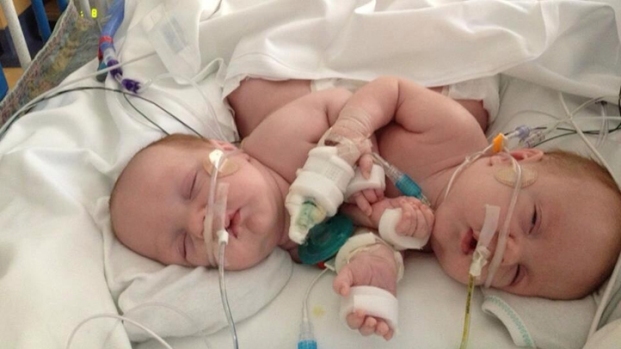 The future didn't seem so bright early on, when the couple found out the twins were conjoined. "We didn't think they had a chance," Ezell said. "We thought they were not going to make it at all, so we decided to abort. It was the hardest decision that a mother has to make about her babies, so we came down here." But when doctors at Medical City told her in March that the boys had a chance, they decided to continue with the pregnancy. "At that point we were just floored," Ezell said. "I could not contain my joy." A fetal MRI was taken right around the time. "Our doctor did tell us, 'Guard your hearts. It's not going to be an easy process.' It was really hard to not be really excited, though," Ezell said. Owen and Emmett Ezell were born on July 17, connected from the chest to the belly button and sharing a liver and intestines. The twins underwent a successful separation surgery on Saturday. She said it's hard not be excited now more than ever. "I'm already planning their first birthday parties, so just all the memories of childhood and giving them a good childhood -- I just can't wait," Ezell said. Doctors have not yet set a release date for the twins, so their parents are balancing time between their children at home and the hospital.